13 negatives : b&w; ; 4 x 5 in. 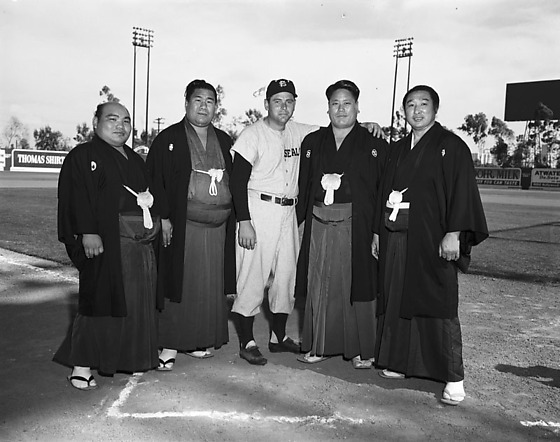 Four sumo wrestlers from Japan, the first since World War II, visit California on July 22 to August, 1951. Includes visits to Rafu Shimpo, San Francisco Seals Baseball field, a sumo tournament or demonstration in the Olympic auditorium where the sumo ring is a boxing ring with a circle drawn in the center, and the four wrestlers standing on forklift in front of airplane at airport. Former yokozuna Maedayama (Kinmatsu Hagimori), Yakatayama (Hakaru Yasutake), Onoumi (Hisamitsu Mojima), and Fujitayama (Tadayoshi Fujita) are dressed in traditional formal wear of kimono, hakama, haori with mon, white tabi and zori. Typed on original negative envelope: Sumo Team from Japan -- 1st to Arrive from Japan after World War II.